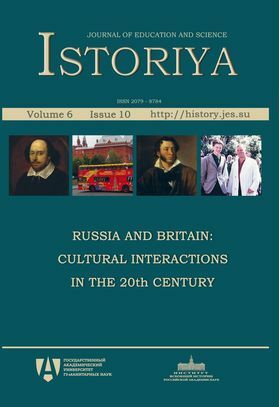 The first article presents an overview of the Russian-British contacts as a part of the history of cultural transfers in the twentieth century (Alexander Chubarian, Institute of World History, Moscow). The first half of the twentieth century is covered by the articles of Antonina Sharova (Higher School of Economics, Moscow) and Michael Hughes (University of Lancaster). Scholars discuss little-known contacts between Soviet/Russian and British historians and other intellectuals in the first half of the twentieth century. New evidence helps readers to grasp the changing image of Russia in Great Britain which was quite romanticized and exoticized before 1917 what, as the author suggests, was perhaps not so bad, stimulating British public interest towards Russia (M. Hughes). However, later the image took a more concrete shape of the country of “red dictatorship”. A. Sharova in her study of personal contacts shows how in the 1920s and 1930s the Soviet state involved itself in the personal contacts between members of academia, so that the Soviet scholars and scientists became a part of the state propaganda machine. Simultaneously such controlled contacts were sometimes encouraged by the state — this can be traced in the analysis of the preparation for several anniversary sessions of the Soviet Academy of Sciences. Soviet-British cultural contacts continued in the period after the Second World War. This is a theme of the articles of Emily Lygo (University of Exeter) and Mikhail Lipkin (Institute of World History, Moscow). Their papers are based on a study of various societies of friendship established after the WWII. E. Lygo argues that even during the period of ideological confrontation from mid-1940s to 1960s the dialogue was not ceasing which serves a testimony of success of cultural diplomacy despite obvious obstacles created by the Soviet system in the communication with foreigners. As M. Lipkin argues, the image of the Soviet Union and Soviet people had got much more positive than negative connotation as a result of expanding public and personal contacts during the Khrushchev period. Dominic Lieven’s (University of Cambridge) publication is a kind of journey to the heart of the British mass media system during the Cold War. This is the first publication of his personal memoirs about his father and Russian immigrants in London who were working for the BBC Russian service. He shows different sides of the struggle between “hawks” and “doves” at the BBC Russian Service and presents his subjective and very interesting image of the secrets of the journalists’ work. The former ambassador of the United Kingdom to the Soviet Union Sir Rodric Braithwaite makes an unusual attempt to write a parallel history of the British, Soviet and U.S. military campaigns in Afghanistan. He concludes that each side learned little from the previous experience; all cases demonstrated a strong belief in a concept that a more developed state can forcefully change for the better the policy of another country, a belief that failed thrice. The last part of the issue deals with literary studies and linguistics. Igor Shaitanov (Russian State University for the Humanities, Moscow) traced the role of Shakespeare in the Soviet literature and theater through the twentieth century. Vera Zabotkina (Russian State University for the Humanities, Moscow) studied changes in the Russian and English language semantics and defined the problem of locating a common cognitive space between the British and Russian people in a rapidly changing environment.